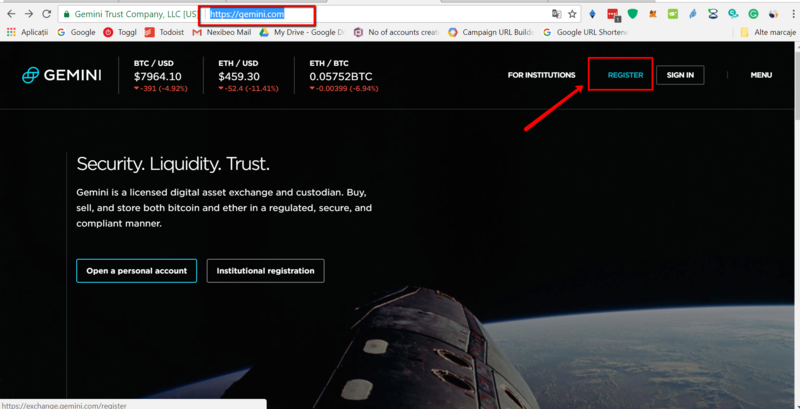 Here, you can find a step-by-step image guide on How to buy Ethereum, on Gemini, a well-known crypto-currency exchange that accepts FIAT. Use the below steps to make sure you safely go through the process of buying your first coin. 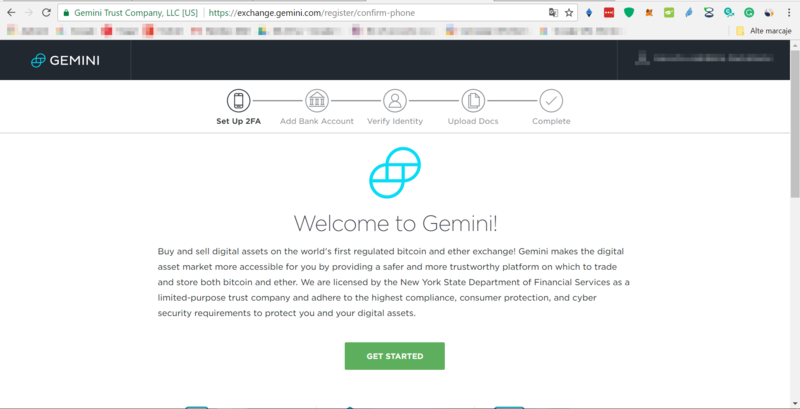 Go to https://gemini.com/. Click on the top-right corner, Register button. We recommend using a very secure password that includes Numbers, Symbols, Capital Letters, and Lower-Case Letters. Use a mix of different types of characters to make the password harder to crack. You will then receive an email with an activation key. You will need to manually input the activation key in the activate-account window as per image below. 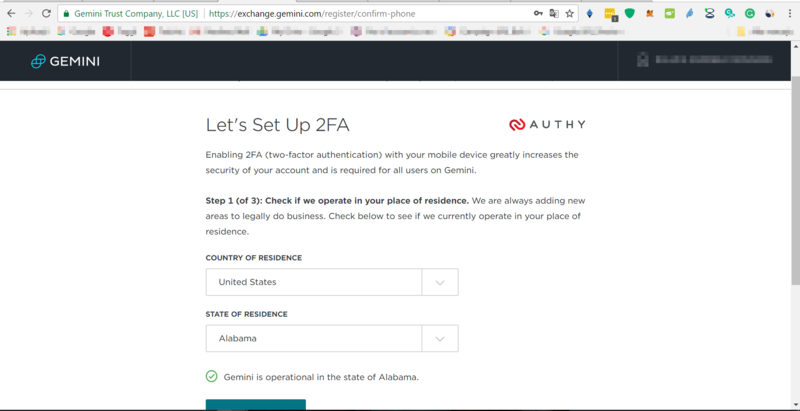 Once you have inserted the activation code, you will then be redirected to the Get-Started page of Gemini. Once you entered your location, enter your phone number as well. At this point, you need to enter your bank account. It is very important that the bank account that you enter belongs to you and not a 3rd party as this is not going to be accepted. 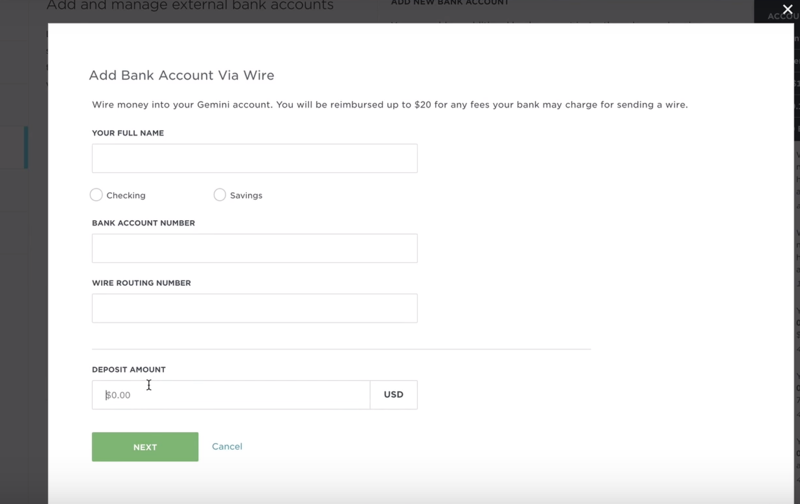 Gemini accepts funding through bank transfers and wires. In order to get your money across faster and begin transactions, we recommend ACH deposits (only available for US customers). These are instant so you can begin trading immediately. If your bank is a corporate one, verification is faster, you just click on it from the drop-down. If it is a local, smaller one, you will need to input manually the data in the required fields. Select Do not see your bank on this list? 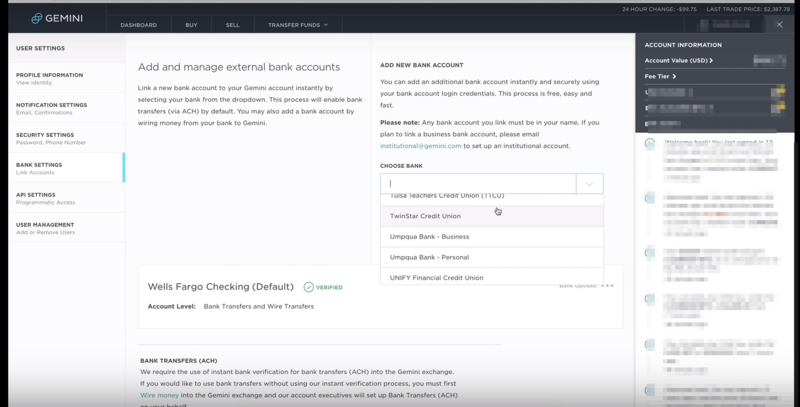 from the drop-down, click Continue, then Add bank via wire and fill in manually the information. You will then receive wire instructions for your transfer. Next step though, is to go through a verification process. You will be required to submit proof of identity ( drivers’ license or passport) and of residence ( a utility bill) and upload these documents as per indications. Please note that verification time depends on the number of applications being processed and can take anywhere from a few to several days. How do I actually buy my first cryptocurrency? 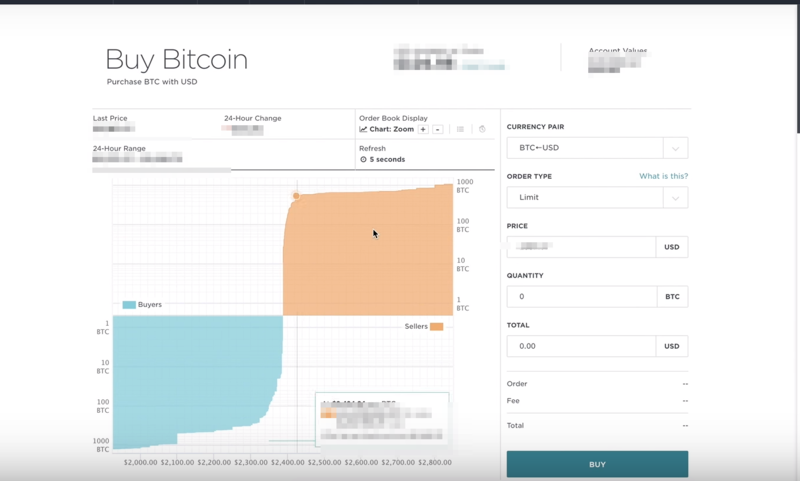 Below you can find the step by step process to buy your first coin. It’s rather straightforward but you need to be careful with a few aspects. What is the difference between Market/Limit? Market stands for the market price. Basically, the asking price of that moment on the exchange and Limit is a fixed price which you are willing to offer for that coin. Let me put it in simpler words it’s like you want to buy a used car and you go to a website and see different offers for the same model. You can either choose to buy it from whoever wants to sell it first, irrespective of the price they ask. Or, you have in mind a budget you are willing to spend and base the purchase on this, choosing an offer or negotiating with an owner so that you purchase at the maximum price you are willing to pay. There might be cases in which you decide to purchase at the market price to do it faster or for other reasons. But most of the cases we suggest you go for the limit option and maybe wait a bit so that your order gets filled. For the moment even if the option is there we suggest you do not use Margin trading, this involving a high risk. Input the amount you want to buy. Input the price you are willing to pay. You need to wait until this is filled and voila! You have your first crypto! You can then, check your balance in the account section. CONGRATULATIONS! YOU BOUGHT YOUR FIRST Ethereum ON Gemini.com. Transferring Ethereum from Gemini to other exchanges. How to transfer Ethereum from Gemini to Bits Blockchain? How to transfer Ethereum from Gemini to BCEX? How to transfer Ethereum from Gemini to B2BX? How to transfer Ethereum from Gemini to Upbit? How to transfer Ethereum from Gemini to Coinfloor? 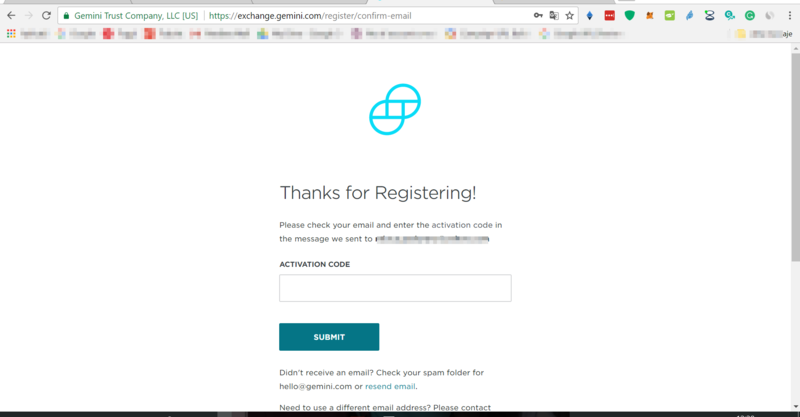 How to transfer Ethereum from Gemini to QuadrigaCX? How to transfer Ethereum from Gemini to HADAX? How to transfer Ethereum from Gemini to OEX? How to transfer Ethereum from Gemini to LBank? How to transfer Ethereum from Gemini to Fisco? How to transfer Ethereum from Gemini to BTCTrade? How to transfer Ethereum from Gemini to Qryptos? How to transfer Ethereum from Gemini to Coinone? How to transfer Ethereum from Gemini to BTCBOX? How to transfer Ethereum from Gemini to OOOBTC? How to transfer Ethereum from Gemini to CoinTiger? 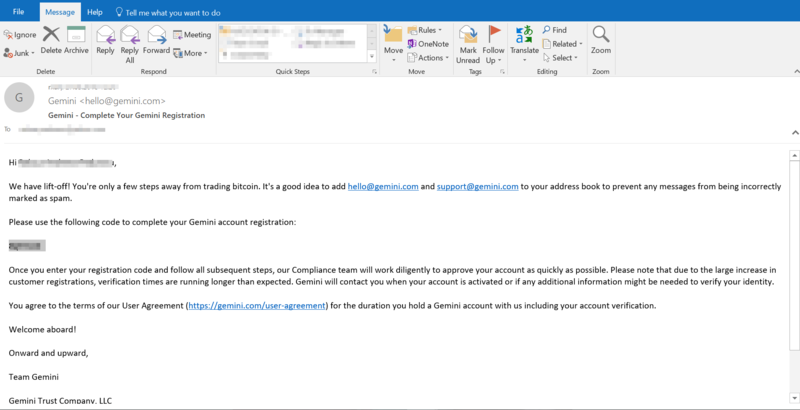 How to transfer Ethereum from Gemini to Bitstamp? How to transfer Ethereum from Gemini to Dragonex? How to transfer Ethereum from Gemini to RightBTC? How to transfer Ethereum from Gemini to EXX? How to transfer Ethereum from Gemini to gate.io? How to transfer Ethereum from Gemini to Exrates? How to transfer Ethereum from Gemini to CoinsBank? How to transfer Ethereum from Gemini to bitFlyer? How to transfer Ethereum from Gemini to Kraken? How to transfer Ethereum from Gemini to Coinbase? How to transfer Ethereum from Gemini to BTC-Alpha? How to transfer Ethereum from Gemini to Bithumb? How to transfer Ethereum from Gemini to BitBay? How to transfer Ethereum from Gemini to Lykke? How to transfer Ethereum from Gemini to Independent Reserve? How to transfer Ethereum from Gemini to EXMO? How to transfer Ethereum from Gemini to DSX? How to transfer Ethereum from Gemini to LiveCoin? How to transfer Ethereum from Gemini to LakeBTC? How to transfer Ethereum from Gemini to Bitlish? How to transfer Ethereum from Gemini to BitInka? How to transfer Ethereum from Gemini to Bitfinex? How to transfer Ethereum from Gemini to ANXPRO? How to transfer Ethereum from Gemini to 1BTCXE? How to transfer Ethereum from Gemini to Gatecoin? How to transfer Ethereum from Gemini to CEX.io? 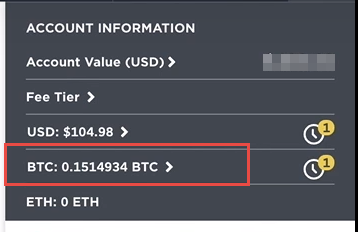 How to transfer Ethereum from Gemini to GDAX (CoinBase Pro)? How to transfer Ethereum from Gemini to Indacoin? How to transfer Ethereum from Gemini to Bitbank? How to transfer Ethereum from Gemini to Allcoin? How to transfer Ethereum from Gemini to DigiFinex? How to transfer Ethereum from Gemini to Idax? 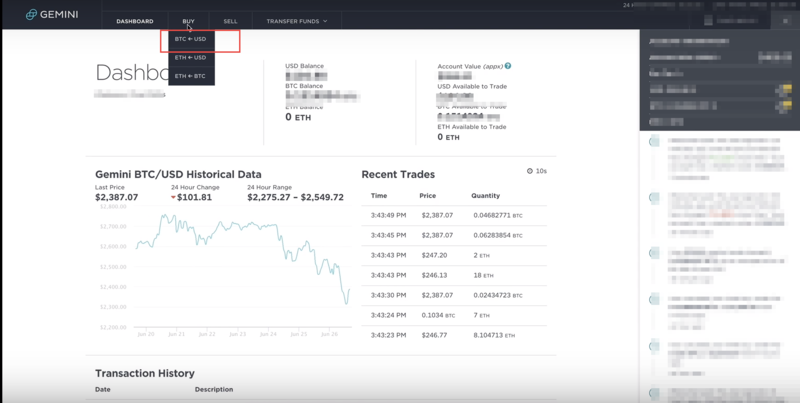 How to transfer Ethereum from Gemini to BitForex? How to transfer Ethereum from Gemini to Simex? How to transfer Ethereum from Gemini to Coinegg? How to transfer Ethereum from Gemini to Coinbene? How to transfer Ethereum from Gemini to TOPBTC? How to transfer Ethereum from Gemini to Coinsuper? 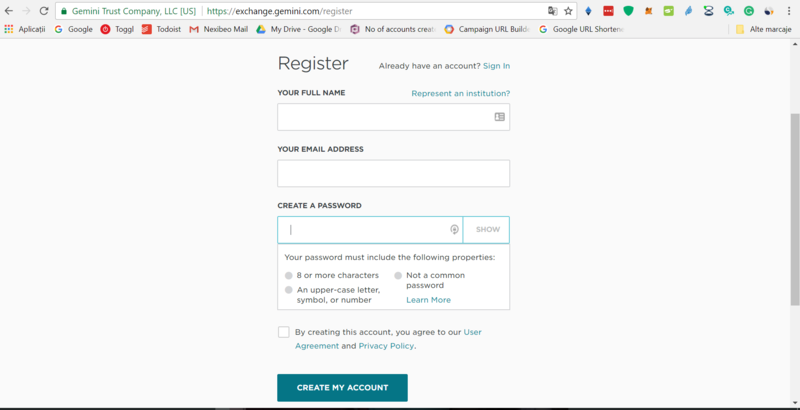 How to transfer Ethereum from Gemini to Poloniex? How to transfer Ethereum from Gemini to HitBTC? How to transfer Ethereum from Gemini to KuCoin? How to transfer Ethereum from Gemini to xBTCe? How to transfer Ethereum from Gemini to Bibox? How to transfer Ethereum from Gemini to CoinFlux? How to transfer Ethereum from Gemini to Bittrex? How to transfer Ethereum from Gemini to Binance? How to transfer Ethereum from Gemini to YoBit? How to transfer Ethereum from Gemini to OKEx? How to transfer Ethereum from Gemini to OKCoin? How to transfer Ethereum from Gemini to MixCoins? How to transfer Ethereum from Gemini to itBit? Transferring Ethereum from Gemini to wallets.